Microsoft Research has prototyped a handy looking gadget that doesn't ever need plugging in. 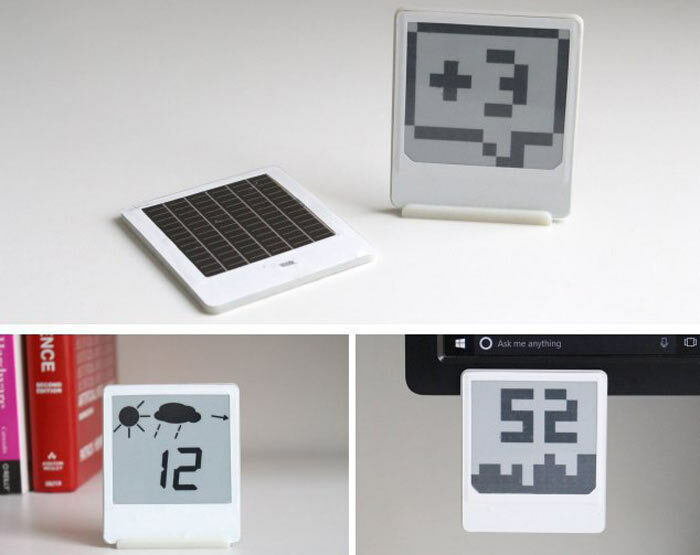 The 'energy neutral' gadget takes the form of an e-ink Post-it note which harvests light from its environment to power its display, processing, and Bluetooth Low-Energy communications. Microsoft's sticky-note device can be used for things other than notes, and examples provided include; message notifications, weather, temperature, and more. Dubbed an 'energy-harvesting situated display' by the research team, the prototype was designed to be thin, lightweight, robust, and wireless. Their form factor makes them almost as easy to deploy as Post-it notes and this similarity is taken further by providing the devices with a sticky pad to their rear, above a flexible solar panel. To keep the power required to a minimum the display uses very few e-ink pixels (132 in this prototype). Efficiencies of modern PV solar panels mean they doesn't have to face the light to power this device – even office ambient light (rather than daylight) is enough for some functionality. Depending upon the lighting available the display can update as frequently as every minute, or as occasionally as once every 25 minutes. The display listens for updates over Bluetooth LE and if one is received will update its display. As well as your PC or smartphone Post-its and alerts, it can display an array of useful information available via the web or from your smartphone sensors. Its limits seem to be simply down to what the accessory software is configured to communicate. In the future the researchers reckon it could be possible to remove the solar panel from the back and use transparent PV cells over the front facing display. It's not clear that anything will come directly from this prototype product-wise but the researchers hope this work will provide a foundation for "more ubiquitous displays throughout the environment which help users to stay productive and informed".